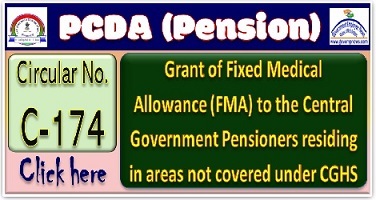 Gant of Fixed Medical Allowance (FMA) to the Pensioners residing in areas not covered under CGHS Area: PCDA Circular No. C-174, OFFICE OF THE PR. CONTROLLER OF DEFENCE ACCOUNTS (PENSIONS), DRAU PADI GHAT, ALLAHABAD- 211014, Circular No.C-174, No.G1/C/0197/Vol- II/Tech, O/o the Pr. C.D.A. (Pensions), Draupadi ghat Allahabad -211014, Dated: - 31.08.2017, To, The PO- Master, Kathua, Srinagar (J&K) The PO- Master, Campbell Bay (Andman & Nicobar) The Defence Pension Disbursing Officer Pay & Accounts Officer Military & Air Attache, Indian Embassay, Kathmandu, Nepal (through Gorkha Record Officer, Kurnaghat, Gorakhpur) Director of Accounts, Panji (Goa) Finance Secretary, Gangtok, PO-I, Thimpu Bhutan The General Manager (Nodal Officer, PSBs) All Managers, CPPC of Public Sector Banks. All Managers, CPPC of Authorized Private Banks. Reference: This office Circular No. 130 dated 07.01.2015. Attention is invited to this office circulars No. 130 dated 07.01.2015, under which a copy of Govt. of India, Ministry of Personnel, Public Grievances & Pensions, Department of Pension & Pensioners’ Welfare, OM No. 4/25/2008-P & PW (D), dated 19.11.2014 regarding grant of Fixed Medical Allowance @ Rs. 500/- PM to Central Government Pensioners/Family Pensioners residing in area not covered under CGHS was circulated to all Pension Disbursing Authorities (PDAs). 2. As per Govt. of India, Min. of PPG & P, Deptt. of P & PW OM No. 4/34/2017-P PW (D), dated 19.07.2017, Govt. has decided to enhance the amount of Fixed Medical Allowance from Rs.500/- to Rs. 1000/- per month. The other conditions for grant of Fixed Medical Allowance shall continue to be in force. These orders will take effect from 01.07.2017. 3. A copy of Govt. of India, Min. of PPG & P, Deptt. of P & PW OM No. 4/34/2017-PPW (D), dated 19.07.2017 is enclosed for immediate implementation and the payment of Fixed Medical Allowance (FMA) to be regulated accordingly wef 01.07.2017. Other conditions for grant of Fixed Medical Allowance circulated in previous circulars will remain unchanged.